I have been such a woefully neglectful blogger, I would not be at all surprised if even my most faithful followers abandoned the hope of reading another of my posts. To that I can only say, Je suis désolé. Actually, I can think of one other thing to say, "Please come back! I'll try harder, I promise." My personal life can be overwhelming at times, like an overbearing house guest it barges in and keeps me from that which I truly love (writing). Life can be like that sometimes, can't it? Overwhelming. Draining. Myopia-inducing. We can get so caught up in our daily struggles that we forget to slow down, take a breath, look up. I've occasionally felt like that on my travels. 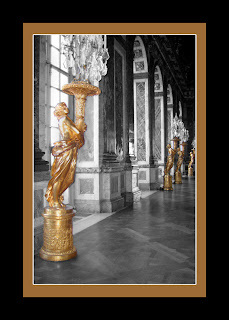 Take my first visit to Versailles, for example. I experienced such overwhelming emotions I found it difficult to process all that I was feeling and seeing. Later, after returning home, I realized I had missed several must-see palace sites because I had been too busy dodging other tourists, trying not to get swept up in the shuffle, looking only at what was in front of me. Do you ever fear that you will get swept up in the shuffle and miss the important things? 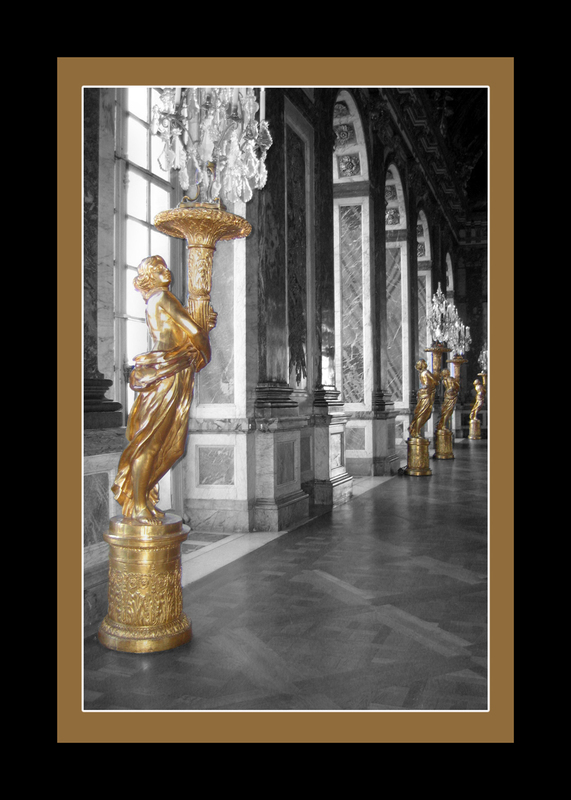 The next time I went to Versailles, I forced myself to slow down, take several deep breaths, and look up. In the Hall of Mirrors, surrounded by frantic tourists, feeling the steady vibes of excitement pulsing through the air, I literally stopped moving and planted my feet. While everyone else rushed to get from one end of the Hall to the other , I remained still. I looked at the mirrors (over 570) and noticed several panels marred by graffiti. I looked down at the honey-hued parquet floor, scarred by age and use. I imagined the Hall in the 17th century, long before it had become one of the busiest tourist sites in the world. I imagined Louis XIV making his daily stroll through the hall on his way to chapel, a hive of courtiers and sycophants buzzing around him. Bathed in a shaft of glorious, golden sunshine, I inhaled deeply, dropped my head back, and looked up at the ceiling. What I saw amazed and humbled me. The barrel-shaped ceiling is decorated with a series of paintings depicting the reign of Louis XIV, the Sun King. 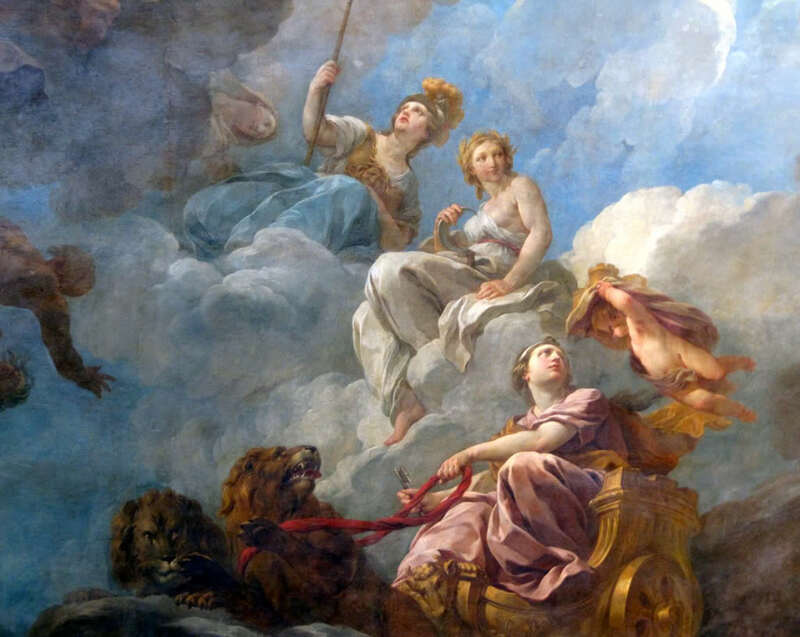 One panel depicts Louis XIV as Apollo, racing through a cerulean sky in a golden chariot. With my gaze still focused up, I moved slowly through the Hall, studying each panel until I felt I had deciphered the story of the exalted Sun King. Using photographic editing software, I later turned the photograph into a watercolor. Today, I decided to frame the image and hang it in my office as reminder not to allow the distractions in my life to keep me from that which brings me joy. 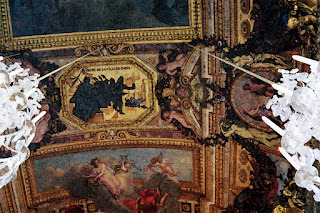 From now on I will remember to slow down, take a deep breath, and look up (Even when I am not in Versailles)! As a lover of children and a longtime Bucket List Holder, I simply had to read the article. When Avery Canahuati's parents discovered she was born with spinal muscular atrophy, they decided to write a "bucket list" for her. They chronicled their infant's adventures in an uplifting blog as a way to raise awareness and money for Spinal Muscular Atrophy. The blog, Avery's Bucket List, written from the perspective of a dying infant with a plucky, curious spirit, will really move you. The parents must be amazing people to be so positive and up looking in the midst of such pain. Avery Canahuati, a sweet infant born with a fatal disease. Terrific advice to live by - wish I remembered it on a daily basis, but if often gets away from me! That and live in the moment!! Merci Victoria! I have an idea, why don't we remind each other to KEEP LOOKING UP? That was an excellent post. At a time which technology continues to push into our lives and we are always on the run, the ability to slow down and "be" is forgotten. Thank you for reminding us to slow down and "look up"
I tend to have the opposite problem. I pause too often to look up, stay focused on one aspect of the world and forget to see the whole or context. I need to synthesize! Leah Marie, Have just found your blogs (I've nearly finished a book about Marie Antoinette by Antonia Fraser) and enjoy them very much. Dear little Avery...hope that one day they find a cure for SMA. Thank you for reading my post, Trophy Husband. Welcome to my blogs Alaine. Thank you for visiting.